So, did you watch the Royal Wedding? Were you one of the crazies that got up at zero in the morning to watch it live? Yes, I was up at zero in the morning, but that's what time I get up every day for work! I did get up at a little earlier than usual, though, so I could stop by my sister Jeanie's house with some freshly baked Blueberry Scones. I was only able to stay and watch a few of the arrivals before heading off to work, and it's probably not a bad thing that I wasn't there for the "make your own fancy hat" crafting. Hilarious! Anyway, keeping the gorgeous Royal Couple in mind, I decided that the royal scones I made should have a royal accompaniment. 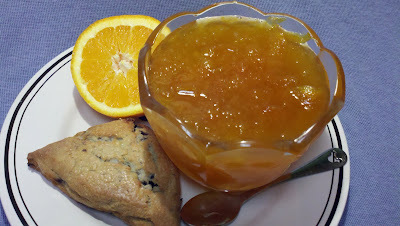 So I made some marmalade! Perfect, don't you think? It's sweet and fresh and perfect for a scone or toast or an English muffin. Now, I know some people may not be a fan of marmalade because of its slight bitterness. That comes from the orange peel. (Technically speaking, it wouldn't be a real marmalade if you didn't add the peel.) But I like to add just the orange part of the peel, the zest, and leave the white pith behind. It makes all the difference! When you make your own, you can control how much of the orange peel to add, so you can make it as sweet or as bitter as you like! If you love the whole peel, then by all means, add the whole peel! Like I always say, it's better when YOU make it! And just wait until you taste it! The thin slivers of orange zest become soft and chewy like candy, with a huge burst of orange flavor. I LOVE it! So give this one a try. Because, seriously, what's a royal wedding party without scones and marmalade? Using a vegetable peeler, remove just the orange zest from the oranges. This is just the orange part of the peel. (It's ok if you get some of the white part). Now peel the oranges as you normally would, removing and discarding the thicker white rind. Thinly slice the orange segments. Place segments and peeled zest in a large pot along with the water and the juice and grated zest of the lemon. Place the pot over high heat and bring to a boil. Reduce heat to a simmer and let the fruit cook for about 40 minutes, stirring frequently. Add the sugar and the finely grated apple. Place a small dish in the freezer. Increase heat under the orange mixture to a rapid boil, stirring constantly. Cook and stir the marmalade until it deepens in color and reaches around 220F on a candy thermometer, or about 15-20 minutes. Test the readiness of the marmalade by placing a teaspoon of the mixture onto the chilled plate and allowing it to sit for 30 seconds. Tilt the plate. The mixture should be a soft gel that moves slightly. If mixture is thin and runs easily, it is not ready. If this happens, just continue to simmer and stir for a little while longer, then test it again. The longer it simmers, the more it will reduce, and the thicker it will get. After you add the sugar, it's REALLY important to stir it constantly. Like, seriously, NO short cuts! Otherwise, you run the risk of burning it, which will ruin the whole batch. I know it's tedious, but just stand there and stir. 20 minutes really isn't that long, and it'll be SO worth it!! The main reason for adding the apple is that it adds natural pectin which helps it to thicken. You won't even know it's there. It just dissolves into the marmalade. I purposely didn't go into the whole jarring and preserving thing, but if that's your thing, double everything and go for it! Have a blast!